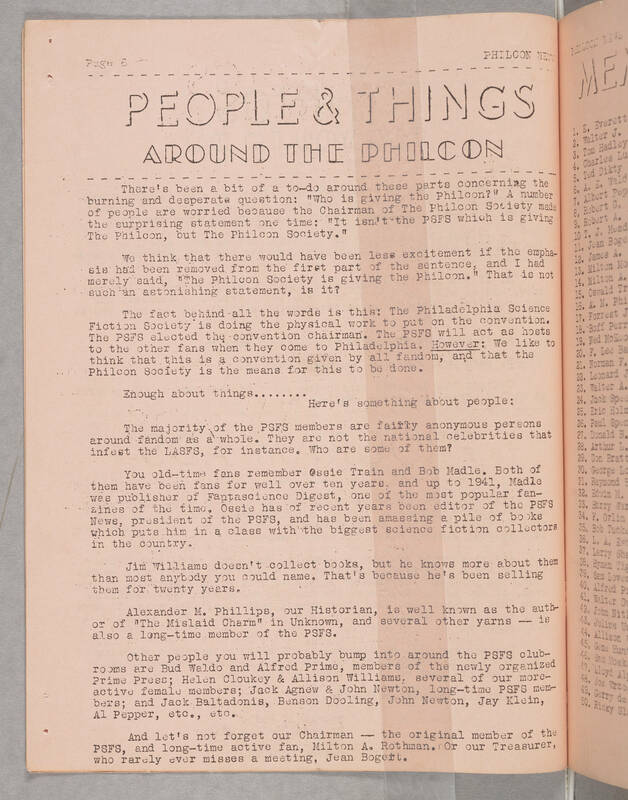 PAGE 6 PHILCON NEWS PEOPLE & THINGS AROUND THE PHILCON There's been a bit of a to-do around these parts concerning the burning and desperate question: "Who is giving the Philcon?" A number of people are worried because the Chairman of The Philcon Society made the surprising statement one time: "It isn't the PSFS which is giving the Philcon, but The Philcon Society." We think that there would have been less excitement if the emphasis had been removed from the first part of the sentence, and I had merely said, "The Philcon Society is giving the Philcon." That is not such an astonishing statement, is it? The fact behind all the words is this: The Philadelphia Science Fiction Society" is doing the physical work to put on the convention. The PSFS elected the convention chairman. The PSFS will act as hosts to the other fans when they come to Philadelphia. However: We like to think that this is a convention given by all fandom, and that the Philcon Society is the means for this to be done. Enough about things........ Here's something about people: The majority of the PSFS members are fairly anonymous persons around fandom as a whole. They are not the national celebrities that infest the LASFS, for instance. Who are some of them? You old—time fans remember Ossie Train and Bob Madle. Some of them have been fans for well over ten years, and up to 1941, Madle was publisher of Fantasyscience Digest,' one of the most popular fanzines of the time. Ossie has of recent years been editor of the PSFS News, president of the PSFS, and has been amassing a pile of books which puts him in a class with the biggest science fiction collectors in the country. Jim Williams doesn't collect books, but he knows more about them than most anybody you could name. That's because he's been selling them for twenty years. Alexander M. Phillips, our Historian, is well known as the author of "The Mislaid Charm" in Unknown, and several other yarns-- is also a Iong-time member of the PSFS. Other people you will probably bump into around the PSFS clubrooms are Bud Waldo and Alfred Prime, members of the newly organised Prime Press; Helen Cloukey & Allison Williams, several of our more active female members; Jack Agnew & John Newton, long-time PSFS members; and Jack Balitadonis, Benson Dooling, John Newton, Jay Klein, Al Pepper, etc., etc. And let's not forget our Chairman — the original member of the PSFS, and long-time active fan, Milton A. Rothman. Or our Treasurer, who rarely ever misses a meeting, Jean Bogert.